“No worker in Florida asked for this terrible bill, but House leadership still decided it was good public policy to fast-track stripping our teachers, transit workers, nurses, and other public servants from having a voice on the job. 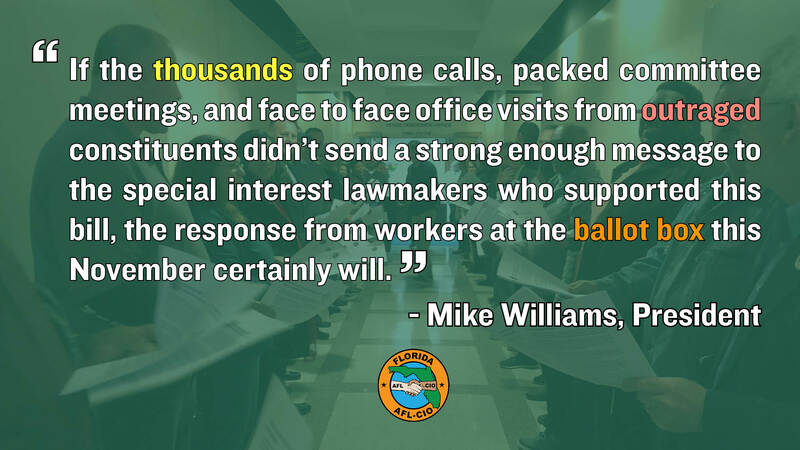 Working people who voiced their bipartisan disgust to union-busting in our state can no longer trust the Florida House to protect their rights in the workplace. 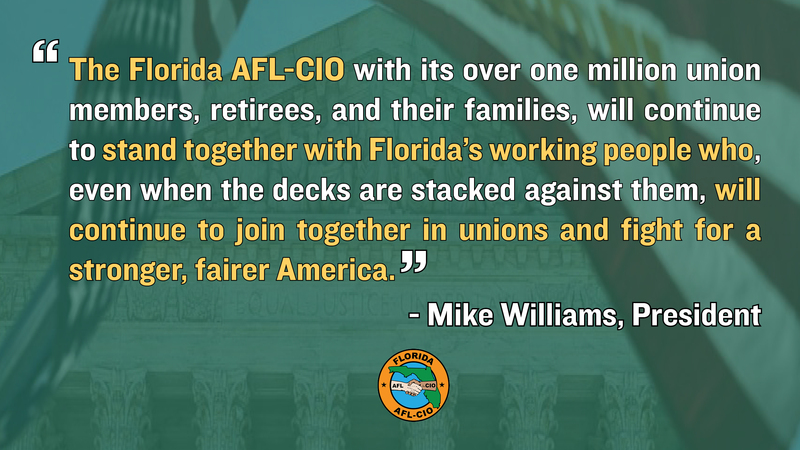 Orlando – Today, delegates to the Florida AFL-CIO 2017 Biennial Convention unanimously reelected Mike Williams, (International Brotherhood of Electrical Workers – IBEW) as President and Andrew Spar, (Florida Education Association – FEA) as Secretary-Treasurer of the state federation. 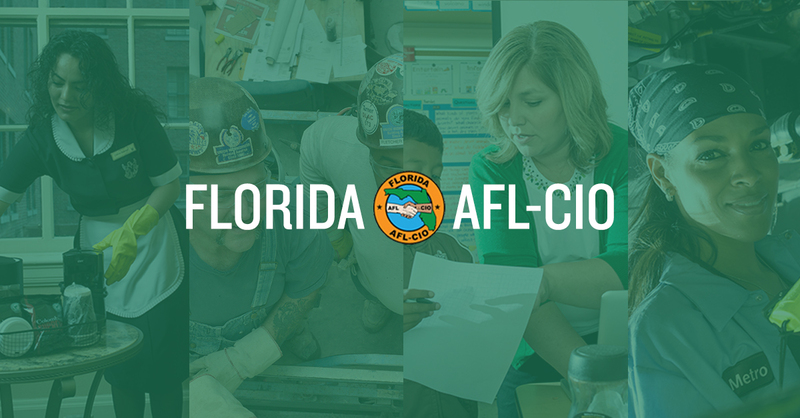 The Florida AFL-CIO represents over 500 local unions, 10 councils, and over one million union members, retirees, and their families in the state. 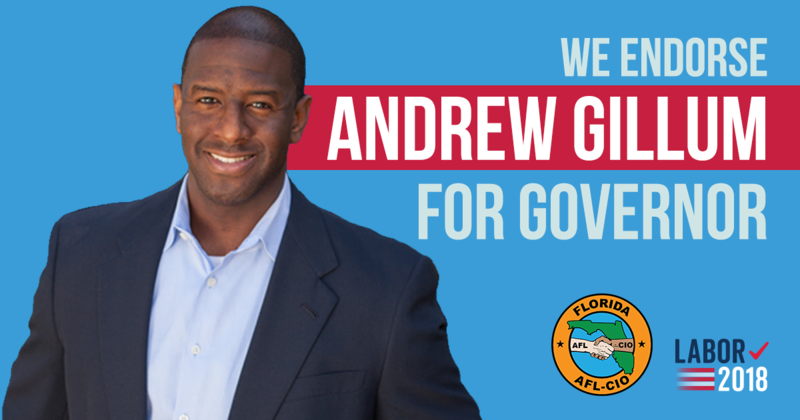 Mike Williams, an electrician and Jacksonville native, will begin his third term as President, first elected in 2009. Volusia United Educators President and music educator, Andrew Spar will now serve his first full term as Secretary-Treasurer of the state federation. “The Florida AFL-CIO condemns the disgusting display of hatred and bigotry our nation saw by neo-nazi and white supremacist groups in Charlottesville this past weekend. It is an absolute disgrace that taking a resolute stance against white supremacy would be so difficult for our President. For Florida’s labor movement, there is no mincing of words or shifting of blame. Our message is clear, there is no place for this type of hatred in our nation. We stand with AFL-CIO President Richard Trumka’s decision to leave the Manufacturing Advisory Council in the wake of President Trump’s continued attempt to draw a moral equivalency between those who hate and those who show the courage to fight back against it.